Sydney Shop Girl: Waiting for the Storm. True Confessions, Big and Small. Waiting for the Storm. True Confessions, Big and Small. I'm sitting here at my desk watching the already grey and soggy clouds gather more ammunition for the anticipated storms that are going to be bearing down on Sydney this afternoon. Just in time for the commute back home. The new Kayanos being road tested on the very same treadmill from which I ordered them. They're my favourite running shoe, comfy from that first footfall on that rubberized conveyor belt of cardiac fitness. My cunning plan for this afternoon is to break up the drive home with a trip to the gym. I'm loving my new Asics Gel Kayano 20s. Mumgo were selling them for $179.99 a few weeks back. US readers, I know that this is still an eye watering price in your book but we're paying $249.99 for them at the sports stores here. Is it any wonder Australians visit your country with 2 empty suitcases and return home with them full even after having sent 2 cartons home via the USPS? It's my last day at work for a week and there's lots to do. Paperwork, tidying loose ends, emails, recording my 'away and who you need to call instead' voice mail message and distributing my baby shower gifts. Two of my colleagues are leaving on maternity leave this week and I've been cooing over the gifts I've wrapped for their babies. I never believed all those people who told me how fast it goes by, how quickly they grow up and lose their physical dependence on you. I have a photo of a newborn Toddler SSG as my screensaver at work. I often look at that photo with wonder. Was he really that tiny and seemingly fragile when he first came home? Was he really that still? These days, fragile and still are words you'd be struggling to apply to Toddler SSG. He collect scrapes to his nose like I collect handbags. The newborn who once allowed me to dress him up as a blue burrito (I tried every swaddle and wrap I could lay my hands on during that colicky phase we're meant to call the more politically correct 'phase of purple crying') now takes great delight in taking those same wraps and blankets for walks around the house. The burrito has is now plain full of beans. His latest thing is biting new toilet rolls. I have no idea why, it's not like he's ever eaten marshmallows and perhaps hopes that's what the paper will taste like. He knows they rolls aren't edible and spits out the paper every time but he won't stop doing it. His toothy handiwork has given the bathroom a distressed and grungy look. It could be the next big thing in toilet decor. If you ever come across distressed toilet rolls the next time you're dining in Surry Hills, remember where you heard about it first. It was wheels of another kind on my mind yesterday morning. Don't you hate how car dramas always happen when you need them least? On the days where you've got a million commitments and places to be other than in the waiting room of a tyre shop? The run flat tyre alert on my car was sending my quietly insistent messages on the drive to work yesterday and it triggered a mad dash around the servos of the Hume Highway in search of a tyre pump that actually worked. I eventually found one and pumped all the tyres but the message wouldn't go away. After a phone call to the very helpful people at Serve Auto Group in Moorebank I was put onto Sam at Big O Tyres up the road and across the bridge. Sam and his team kindly checked all my tyre pressures and reset the flat tyre sensor for me and didn't charge me a thing. I also give them extra points for not laughing as they broke it to me gently that I'd been chronically underfilling my tyres. I was in sedan tyre pressure mode all this time and not SUV apparently. Thanks again Sam, I owe you. I've been doing a bit of reading. Nothing deep and meaningful but I thought I'd have a chat anyway. I never did read Andrew Morton's first Diana biography so I wasn't sure what to expect in this second instalment. Would it be gushy and adoring? Would the Royal Family be painted as the villains? Would Diana's life post Princess-dom be discussed? I actually really enjoyed this book. 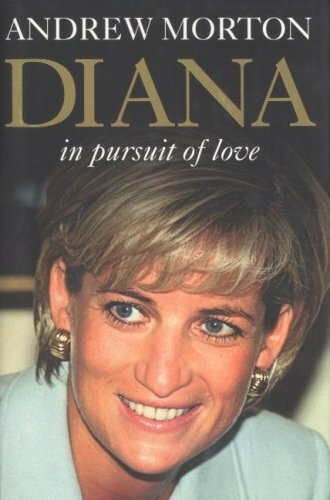 'Diana In Pursuit of Love' is an intelligent and balanced discussion about the Princess of Wales troubled personal life and her attempts to improve herself and overcome the odds seemingly stacked against her. I grew up with 'Lady Di and Fergie' being on the cover of the women's magazines practically every week. Morton's handling of Diana's own issues as well as the agendas of those close to her manages to stay objective for all parties involved. To some degree, I think we all face some of Diana's problems and while it's tempting to think that wealth, status and the adoration of most of the world can ease the pain and suffering, it's clearly not the case. A somewhat less enjoyable read was Katie Price's first autobiography, 'Being Jordan'. You know I have a soft spot for this kind of read. Often they're hilarious, self depreciating works with a couple of revelations that make you lightheartedly reflect on how you handle your own life or at the very least they're a highly photoshopped photo spread on how the other half live. Sadly, 'Being Jordan' made me really uncomfortable. I think the confessions ended up in the dodgy territory of explicit oversharing. I don't think it's right to deny that sexual abuse has happened or that cheating and affairs took place but the graphic details weren't what I was expecting. I understand Katie has written a series of autobiographies each about three years apart. I remember watching her reality TV series and seeing her go off to book signings with very young girls present. I always assumed the books were fictional page turners heavy on romance, shopping and the high life. I wonder what those young girls come away from these books with? It's still early days for me with 'Being Jordan' but so far, it's not been the sudsy celebrity read I'm craving. Over to you, have you read either of these books? Thoughts? I haven't read either of those books, but they do look interesting! Wouldn't mind if you sent some of that stormy weather up north too - it's been so hot and humid here, they keep predicting storms to break it but they still haven't eventuated for a few days. Hehehehe Distressed toilet paper... loving it! My puppy dog has also taken to biting toilet rolls (and diamond earrings)! That photo of Toddler SSG reminds me of my youngest- he's now 2 and a bit and thankfully has settled in his daredevil ways. Haven't read those books, but was tempted to buy Jordan's autobiography when I saw it on sale for $3 at a book store. I remember watching her reality series, but it didn't really do much for me. Enjoy your week off work.